Which is? 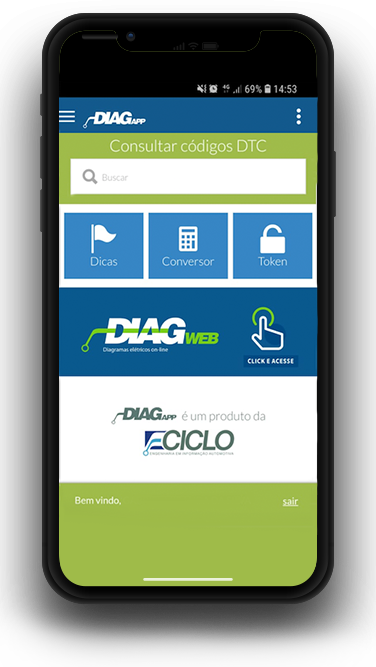 It is an application developed by Ciclo Engenharia which provides fault code descriptions (DTCs). Are more than 70 thousand codes cataloged, with original description in English and the possibility of translation, image search and videos. DiagApp also serves as TOKEN from Diagweb in a change of machine and alert of new tips published on the Blog of the Engineering Cycle or response to technical support requests. Download yours for free! Copyright © 2000 - 2019 www.ciclo.eng.br, ALL RIGHTS RESERVED. All site content, all photos, images, logos, trademarks, sayings, sound, software, set image, layout, served here are the exclusive property of Ciclo Engenharia. It is forbidden any reproduction, total or partial, of any element of identity, without express permission. Ciclo Engenharia - CNPJ: 97.405.096/0001-00. Av. T-4, 1478, Sala A74 e A75. Goiânia - GO - Brasil. Este site usa cookies, se continuar navegando nesta página, consideramos que aceita seu uso nos termos indicados na “Política de Privacidade”.